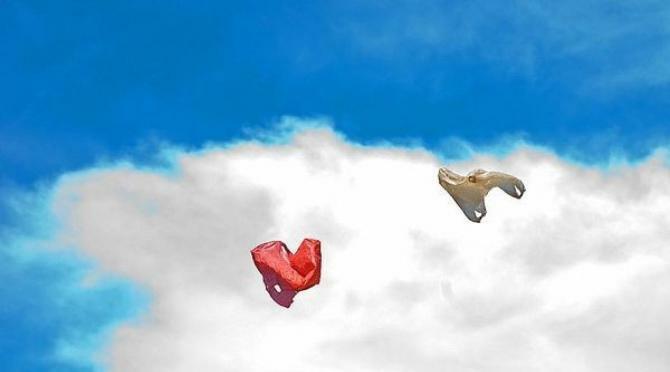 Utterly weird and beautiful short film about the life of a philosophical plastic bag with the voice of the legendary Werner Herzog. Plus bonus film of Werner eating his shoe. Clips from Les Blank's classic 1980 short, "Werner Herzog Eats His Shoe." (visit lesblank.com to obtain the whole film). The film documents Herzog fulfilling a bet he made with Errol Morris: if Morris would finish his brilliant first feature "Gates of Heaven," Herzog said he would eat his shoe. He uses this public stunt to say some very serious things about American pop culture, filmmakers becoming "clowns" to promote their work, and the culture of images (or lack thereof).